The scientific name of Winter Cherry: Withania Somnifera Dunal. Winter cherry or Winter cherry also known as Indian ginseng -Ashwagandha is an annual evergreen Shrub growing up to 1 meter tall, stem bearing 3 leaves from a node, mostly found in open places or disturbed areas of dried soil. Flowering is after September (end of monsoon season), flowers are small and green in colour. The ripe fruits are deep orange or red. Root is the useful part of this plant which is used as an ingredient in Ayurveda medicines. 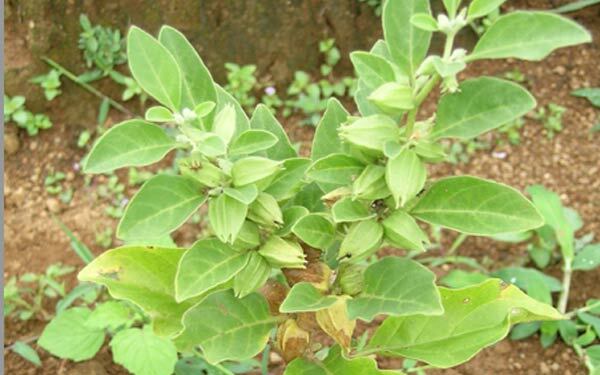 Vatha, Kapha, Skin diseases, TB, reduce blood pressure, Asthma, increase sexual power, modern studies shows the properties to fight against cancer. Dried roots powder mix in warm milk or water and drink for 15 days. Fry in ghee and use daily can induce sexual power, Gee and honey with dried powder can use to increase breast milk for feeding ladies.